Rewarding Times are delighted to team up with WineOnline to offer you the must have Christmas Wine Case. Each year WineOnline.ie create the perfect case of Christmas wines and last year’s case was no different. In fact, last year’s case was cheaper, but this year they have included Late Bottled Vintage Port, Dessert wine and included better wines than ever before. Full sets of tasting notes will be included with every Christmas Selection case, so that you or the host, knows a thing or two about the provenance of the wines and what foods and courses to match them with. The case takes you from Aperatif wines, through starters and mains. Think bursting Fresh sauvignon blanc with seafood starters, and some of the best Pinot Noir for a turkey main course. For white drinkers, the white viognier for turkey comes from two of the most prolific and famous winemakers in the world, of Domaine de la Romanee-Conti Fame and of Domaine Dujac fame in Burgundy. 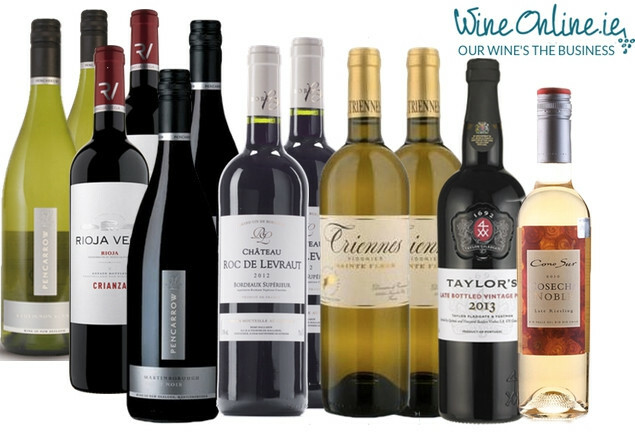 These 12 wines individually have a retail cost of €246.00. Rewarding Times customers can get them this week only for a total of €190, saving 25% or €56.00. This would be a perfect gift for someone hosting Christmas, whether that’s you or someone else. In 1989, two Burgundians, Jacques Seysses, founder of Domaine Dujac, and Aubert de Villaine, owner of Domaine de la Romanee-Conti wjho produce some of the world’s most expensive wines, went in search of new vineyards. Their attention turned to Provence where they were convinced the potential for great wines was enormous. After a long search, they discovered the Domaine du Logis de Nans in the Var, east of Aix en Provence. Intense perfume of apricot, honey-suckle, white flowers and honey of lavander. This wine strikes a beautiful balance between aromatic richness, crisp acidity and mineral structure. Viognier ages gracefully. This is from the 2015 vintage. One of Rioja’s oldest wineries in Spain, Rioja Vega is today one of the few wine cellars whose winemaking tradition dates back to the dawn of wine culture in this outstanding region. Included here because it was just awarded Gold medal at the Irish wine awards as the best Old World Red Wine in Ireland in the €15 per bottle category. 2015 was also considered an exceptional vintage across all of Europe and this is opening up nicely now. There is a complex array of aromas on the nose, with notes of red fruits and liquorice and subtle hints of toast, spices and cinnamon. It is silky, pleasant and enveloping on the palate, long, balanced, with very good tanins. Taylor's created the Late Bottled Vintage style of port and is not only acknowledged to be its finest producer, but remains the international brand leader. Blended from wines of a single year, LBV ages from four to six years in cask and is ready to drink when bottled. We have included two wines in this years Christmas Selection that are repeats from last year’s case. They are exceptional wines and this Sauvignon is fresh, bursting in the mouth with citrus fruits and lemon. It is creamy and rich like great Sancerre. It is dry to taste and medium-bodied, elegantly proportioned, bright and juicy flavours of white stonefruits, gooseberries and fresh herbs feature on the palate. The wine flows smoothly, gently fading to a dry, fine-textured finish. This is a fresh juicy, up-front Sauvignon Blanc with gooseberry fruit and a delicious smooth mouthfeel. At the Air New Zealand wine awards, one Pinot Noir topped them all, taking the Gold medal. Unfortunately this ‘second label’ Pinot Noir beat every single wine, including the first wine from the same estate, which was twice as expensive. Martinborough Pinot Noirs pick up a lot of complexity. The grapes typically hang on the vine for three weeks longer than elsewhere and so, the wine is rich, smooth and velvet like, with a backbone of tannin and smooth fruit that leave you wanting more and more. As New Zealand Pinot Noirs go, this is exceptional and it is on promotion at WineOnline.ie at €19.00 until the New Year. Pinot Noir is said to be Turkeys best wine match at Christmas, so have this on the table this Christmas. Remy Ballerin is a third generation winemaker and his winery is a small family owned operation. On promotion at €15.00 at WineOnline.ie now, you won’t find better Bordeaux at that price. We have tasted hundreds of Bordeaux in our quest for great Bordeaux that will stand the test of time and this beats them all for quality and value. It has won a multitude of medals and has been endorsed by many wine critics for its value proposition, such as Jancis Robinson and Jeb Dunnuck. Try this and you just won’t be disappointed. It is simply Sublime. Concentrated and spicy, this is full of generous tannins and delicious black plum fruits. There is an opulent texture and while it is a ready-to-drink wine, give it 2.5 – 3 hours of decanting time ahead of consumption. When it comes to the Cheeseplate at Christmas, this is the time to break out a late harvest Riesling. Botritised grapes have concentrated sugars and they shrivel. As a result the wine tastes of Raisins and prunes and a small glass is usually plenty. This Late Riesling is a unique concept of sweet wine. It is produced from delicately selected botrytized grapes grown in Mulchén, one of the southernmost vineyards in Chile. Located in the Bío Bío Valley, it is an ideal area for the production of noble wines because of its exceptional climate and red clay soils. These special characteristics are what give this wine the name Cosecha Noble. If you have any queries or wish to get an all reds, or an all whites case, please call WineOnline.ie directly on (01) 8867740. WineOnline.ie also have 6 bottle Gold and Silver Christmas Day Wine Boxes with tasting notes, and a full range of gifts and hampers and they delivering gifts across the country right up until Christmas. Irish Owned, and family operated, they have been in business since 1999. Expiry for redemption is strictly December 10th - No consultation will be entered into whatsoever after this date. However - We will deliver after this date, and up until Christmas eve (Excluding weekends) once redemption is completed before the expiry date and a delivery date requested. Orders will be delivered within 5 working days from receipt of order, unless a delivery date is specified at time of order in the order notes.